Before you begin shopping for new patio furniture, outdoor pillows or strands of lights in anticipation of spending some time outside, you should take a quick look around at the dirt and dust that has accumulated all winter long. This is the time to focus on windows, window sills, trimming up the landscaping, and sweeping or power washing the deck/porch. For reference on the simplest, quickest and most efficient way to wash those windows, take a look here: Cleaning Windows The Right Way. A dirty window can really change the look and feel of your patio. You’ll be amazed at how much nicer everything feels once the windows are cleaned! Don’t forget to trim those hedges and plant or pot a few nicely placed brightly colored flowers. 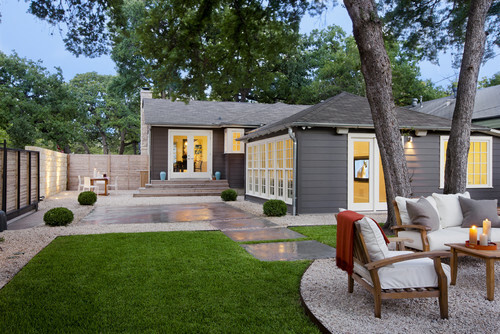 This gives your backyard the “put together” look that we know you want. After the hedges are trimmed, take some time to sweep off the patio and dust off any furniture or decorations that have either been in storage or weathering the elements all winter long. No one wants to sit on a dusty love seat, right?? If you have cushions on your furniture, take those off and beat the dust out of them. Grab your garden hose and spray off your furniture: dining tables and chairs, swings, lounge seats, side tables, all of it. Once that has dried, just spot clean with some Red Juice for any remaining pesky patches of dirt and dust. Now you are ready to add some color! Set out some colorful outdoor pillows, some pretty citronella candles, string up some globe or rope lights, set up the umbrella and pour yourself a margarita! You deserve it!